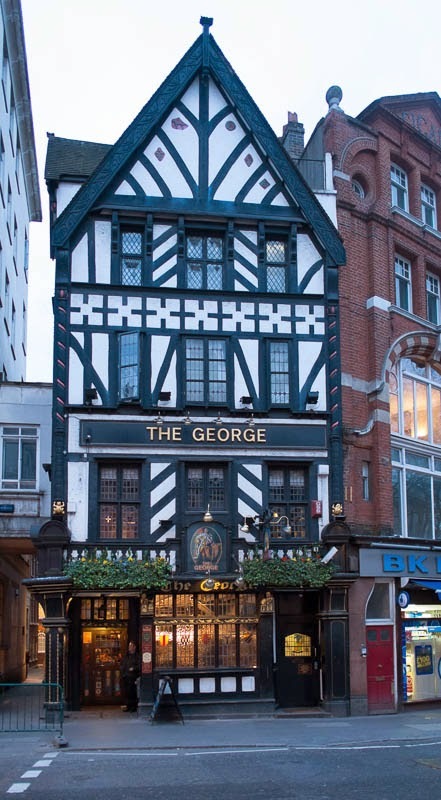 This George was named after King George III and started life as a coffee house around 1723. George was the third longest reigning monarch, Victoria and Elizabeth II (the current queen) the two who have reigned and lived longer. Like many of London's older buildings this one is purported to have its very own ghost rumbling around in the cellar, this one a headless cavalier. We have a new royal George now who will one day be George VII. I guess we will see the name George popular again maybe a new George bridge or perhaps the new garden bridge will be George gardens. Will the name George be popular outside of the UK? What do you think? Coming back to the 21st century, a wee reminder if you haven't already entered the competition to win an iPhone 5S then pop over here for details. The name George is not so popular here, I even have never heard it. We had a dutch variant "Sjors" but you don't hear this name anymore either here. But those old houses I like very much. This wonderful building is an absolute classic. I adore the building. The building looks so wonderfully English. George is a pretty good name, I think... perhaps more as a fictional character. Hey, at least they didn't name him Moon Unit or Dweezil.